I've been meaning to read this for quite a while, and one of City Lit Books' clubs was reading it, so I finally did! This was full of delights, so I'm glad I got around to it. It's a novel-in-verse, but to my fairly-untrained-eye not too heavy on formal poetic structures: no rhyming or fixed meter. Mostly it's structured as "long line/short line". The enjambment throughout made me really slow down; it allows the imagery to strike with more force than if it had been written as straight prose. 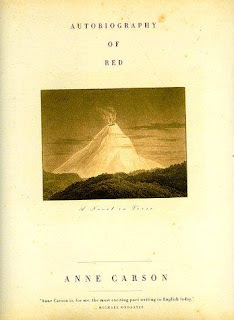 A re-telling of the myth of Geryon (a monster killed by Hercules), Autobiography of Red recasts the tale as a coming-of-age story. Geryon is still, perhaps, a monster—completely red, and bearing wings—but also just a boy, and the novel pushes playfully at our belief/disbelief in Geryon's physical monstrosity. Growing up on an unspecified island at some unspecified time (seemingly the latter part of the 20th century), Geryon falls in love with his Herakles, eventually running into him again in South America. I really enjoyed this. Loneliness and longing are the bedrock of the text, with the volcanoes throughout providing what one person at club called "conceptual rhymes": an embodiment of Geryon's sexuality, fear, and alienation. This is a beautiful and image-heavy text; Geryon's photography and synesthesia suffuse it. At club, we talked a lot about color symbolism throughout, and identified Ancash (Herakles' Peruvian lover) as a possible metaphor for the arrow that killed the mythological Geryon. I kind of dig, but am a little nonplussed by, the before-and-after material here, which provide a kind of fragmentary, context-less framing for the main text—recreating some of the feeling of being translated from partial texts. Also, this is all on me, but I'm unlikely to follow any deep Stein allusions. Carson courageously resists going down a threatened Heidegger-and-time sub-plot, and I applaud her for it. 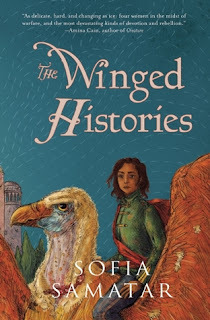 The biggest reason I've had this underlined on my list is because Sofia Samatar cited it as a major influence on The Winged Histories, and her Olandrian books are one of those cases where I'm basically eager to construct an entire syllabus around it, just for my own enlightenment. 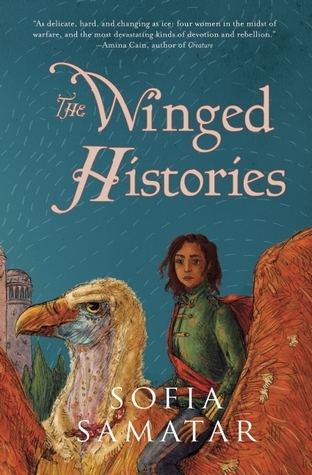 Reading Autobiography of Red definitely enrichens a few different elements of The Winged Histories, so: good deal. I'm not sure how often I'll return to the Celestial Hobo poetry reading club, but it was a treat to get to think over this book with them. Their next selection is Olio by Tyehimba Jess, March 6th; you can find out more about them, and many other events, at City Lit Books.